^ See, for example; Guðmundsson, H.H. "Þekkir þú þennan mann?" Skakki turninn, 12 October 2009, pp. 19–27. ^ a b Fettes, James (29 October 2013). "Professor's 15-year search for answers seeks to crack the secret code to the death of the 'Somerton man' found on an Adelaide beach". Herald Sun. Retrieved 27 June 2015. ^ "Top 10 Secrets Taken to the Grave". Retrieved 1 December 2014. ^ a b c d e f Clemo, M. "'Poisoned' in SA – was he a Red Spy? ", Sunday Mail (Adelaide), 7 November 2004, p 76. ^ a b c d Officer in Charge, No. 3. C.I.B. Division, "Unidentified Body Found at Somerton Beach, South Australia, on 1st December 1948", 27 November 1959. ^ a b c d Jory, R. (2000) "The dead man who sparked many tales", The Advertiser, 1 December 2000. 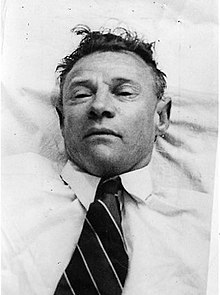 ^ "Unsolved Death from 1948: The Somerton Man (The Taman Shud Case)". Sometimes Interesting. 25 June 2011. Retrieved 28 July 2015. ^ Britten, Nick (2011年2月1日). “Top 10 uncracked codes”. The Daily Telegraph. http://www.telegraph.co.uk/news/newstopics/howaboutthat/8293375/Top-10-uncracked-codes.html 2014年1月10日閲覧. "There were no clues as to his identity and dental records and fingerprints matched no living person." ^ “Dead Man Walks into Police H.Q.”. The News: 2. (2 December 1948). http://trove.nla.gov.au/ndp/del/article/129890443. 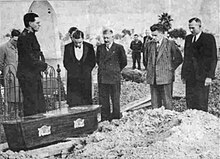 ^ a b "15 Jun 1949 - INQUEST TO OPEN ON BODY OF UNKNOWN MAN - ADELAIDE". The Canberra Times. 15 June 1949. Retrieved 27 June 2015 – via Trove. ^ a b c d Inside Story, presented by Stuart Littlemore, ABC TV, screened at 8 pm, Thursday, August 24th, 1978. ^ "World War II Nominal Roll, "Boxall, Alfred". Australian War Memorial. Retrieved 8 December 2008. ^ a b c Lewes, J. (1978) "30-Year-Old Death Riddle Probed In New Series", TV Times, 19–25 August 1978. ^ "Jestyn's reaction when she sees the dead man's bust". YouTube. Retrieved 23 May 2010. 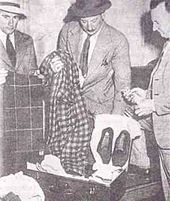 ^ Pyatt, D. Mystery of the Somerton Man Archived 2007年9月8日, at the Wayback Machine., Police Online Journal, Vol. 81, No. 4, April 2000. 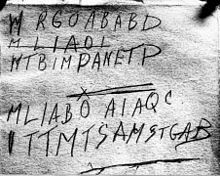 ^ "Computational linguistic analysis of the Tamam Shud Cipher". John Rehling. Retrieved 4 August 2014. ^ a b Phillips, J.H. "So When That Angel of the Darker Drink", Criminal Law Journal, vol. 18, no. 2, April 1994, p. 110. ^ The Washington Post, "Harry Dexter White, Accused in Spy Inquiry, Dies at 56", 18 August 1948, pp 1–2. ^ "BOXALL ALFRED : Service Number - NX83331". WW2 Military Records. National Archives of Australia. Retrieved 5 December 2013. ^ a b Stateline South Australia, "Somerton Beach Mystery Man", Transcript, Broadcast 27 March 2009.. Retrieved 27 April 2009. 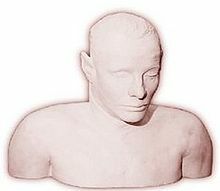 ^ Stateline South Australia, "Somerton Beach Mystery Man", Transcript, Broadcast 15 May 2009.. Retrieved 3 August 2009. ^ "Timeline of the Taman Shud Case". Professor Derek Abbott. Retrieved 20 April 2010. ^ Watkins, Emily (16 July 2013). "After 65 years, new picture could reveal Unknown Man's identity | News.com.au". news.com.au. Retrieved 17 July 2013. ^ Wood, Graeme. "The Lost Man". California Sunday. Retrieved 4 June 2015. ^ G. M. Feltus, p. 108. Coroner's Inquest, 1949: Thomas Erskine Cleland, Inquest into the Death of a Body Located at Somerton on 1.12.48, State Records of South Australia GRG 1/27 File 71/1949, 17 and 21 June 1949. Coroner's Inquest, 1958: Thomas Erskine Cleland, Inquest into the Death of a Body Located at Somerton on 1.12.48, State Records of South Australia GRG 1/27 File 53/1958, 14 March 1958. Robyn Coghlan, Connections From London to the Antipodes: The Family of John Boxall and Sarah Hugkulstone, Acme Publishing Co., Hawker, ACT, 2008, ISBN 978-0-646-50443-8. Gerald Michael Feltus, The Unknown Man, Klemzig, South Australia, 2010, ISBN 978-0-646-54476-2. Ruth Balint, "The Somerton Man: An unsolved history," Cultural Studies Review, Vol. 16, no. 2, pp. 159–78, 2010. Omar Khayyam, The Rubaiyat of Omar Khayyam: First and Fifth Editions, translated by Edward FitzGerald（英語版） Courier Dover Publications, 1990, ISBN 0-486-26467-X. Michael Newton, The Encyclopedia of Unsolved Crimes, Infobase Publishing, 2009, ISBN 0-8160-7818-1. John Pinkney, Great Australian Mysteries: Unsolved, Unexplained, Unknown, Five Mile Press, Rowville, Victoria, 2003. ISBN 1-74124-024-7. Geoffrey Sherington, Royal North Shore Hospital, 1888–1988 : A Century of Caring, Horwitz Grahame, Sydney, 1988, ISBN 0-7255-2104-X. Margaret Rice, The Close of an Era: A History of Nursing at the Royal North Shore Hospital, 1887–1987, St. Leonard's, N.S.W: Royal North Shore Hospital Graduate Nurses Association, 1988, ISBN 0-9593811-4-7. Roger Vanderfield, Royal North Shore Hospital: Service in War and Peace, University of Sydney, Sydney, 2001. Daniel Connell, The War at Home: Australia 1939–1949, Australian Broadcasting Corporation, Crow's Nest, NSW, 1988, ISBN 0-642-53054-8. Richard Walker, Curtin's Cowboys: Australia's Secret Bush Commandos, Allen & Unwin, Sydney, 1986, ISBN 0-86861-765-2.